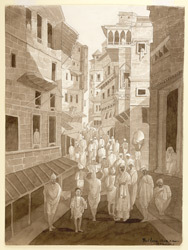 Sepia wash drawing of crowds in the brassworkers bazaar at Varanasi by George Francis White (1808-1898), c.1829. The drawing is inscribed: 'Tuthera Bazaar Benares', and on the reverse: 'Rajendra's House in the Tuthera Bazar Benares'. The inscriptions appear to be in differing hands, but may have been added by White later in life. The inscription to another view of Benares dated 1829 would presumably be White's hand at this period. Varanasi in Uttar Pradesh has traditionally been famous for its brasswork. In 1909 there were over 600 factories here, owned mainly by rich Banias or Kaseras who supplied their employees with tools; the larger of the factories employed 20 or more people. These skilled artisans commanded high wages and were paid according to the amount of work done. Varanasi brasswork, produced chiefly for domestic and ceremonial use is noted for its distinctive rich golden hue and fine quality.